Create magical moments by ordering online this Amazing Parker Urban Muted Black GT BP Penfor your loved ones and spread your warm feelings into their hearts. 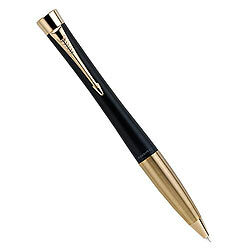 The body of this Pen has graphic design and golden finishing is made on its cap. It has Gold Plated Clip and Trims. It is nicely presented in decorative Gift Box.